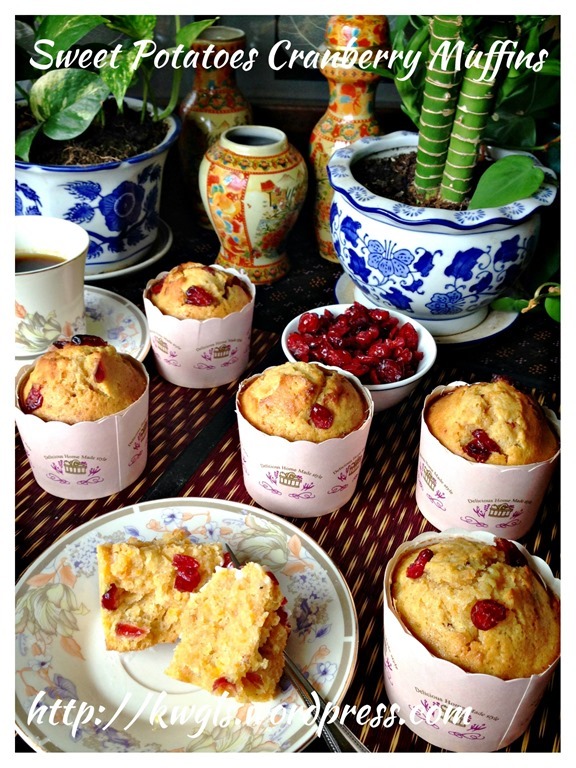 This is 3rd in a series of my muffin recipe rebuilding (after my blueberry yoghurt muffins and simple chocolate muffins). 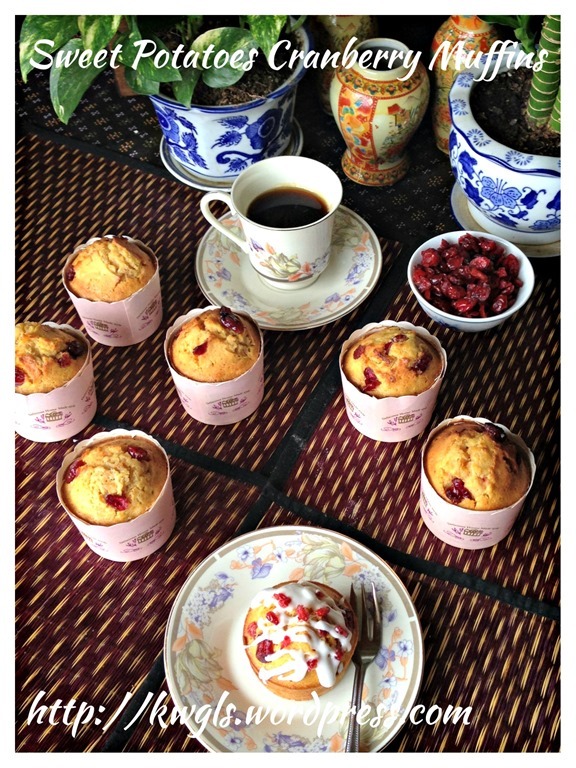 I have self targeted to provide readers a choice of 8-10 muffins within a period of one month. 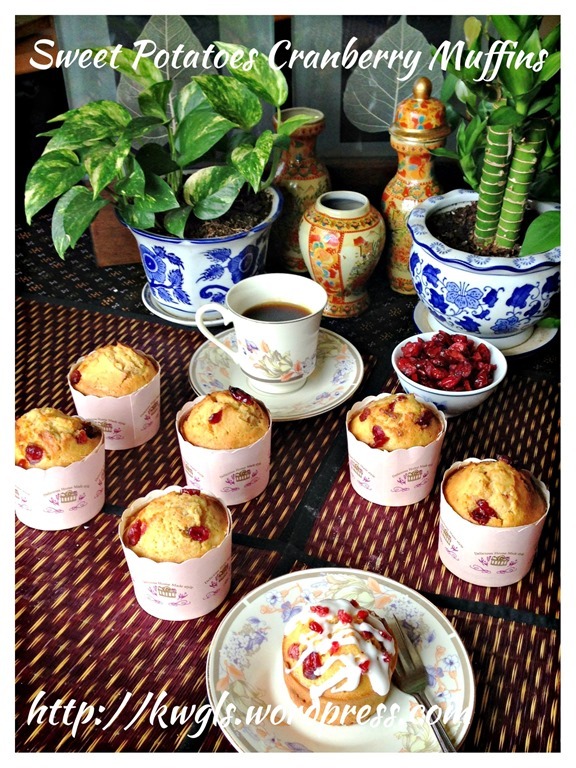 I will rewrite some of the muffin recipes, new picture taking and share with readers. 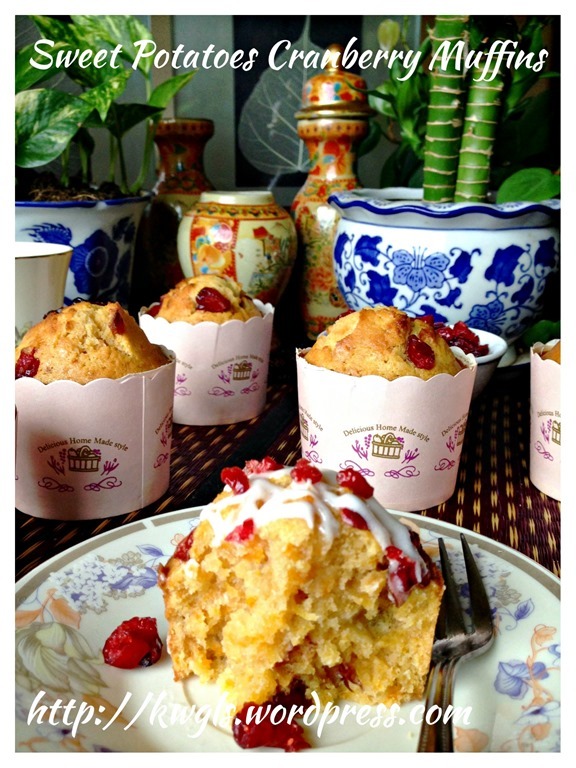 Muffins are easy to made and in fact, it was always associated the quick bread categories of baking. 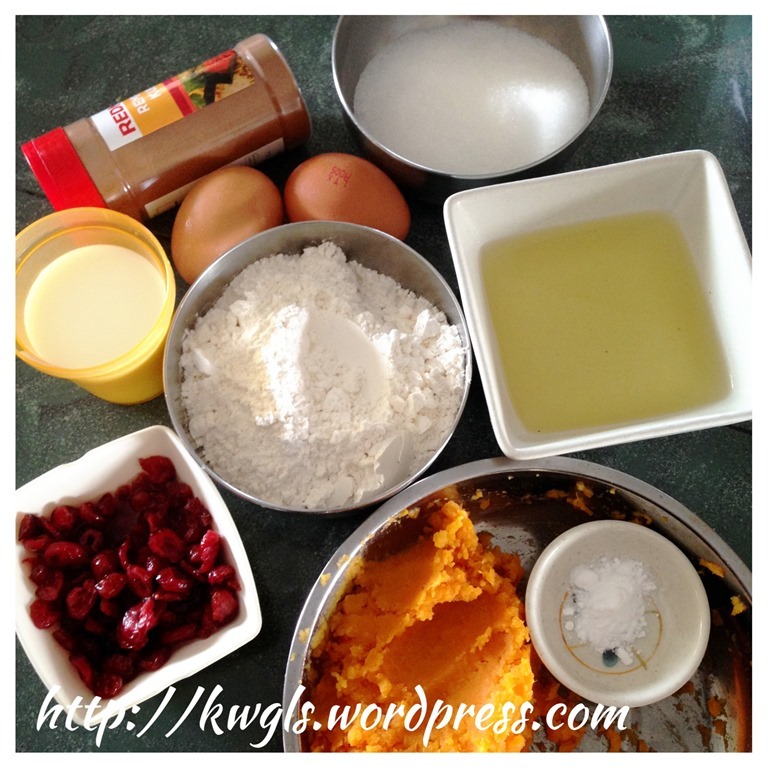 It generally utilizes less fats and have less complicated procedures in the preparation as compared in cupcakes. Unlike cupcakes that needs very a well mixed emulsion, lumpy batter are acceptable. 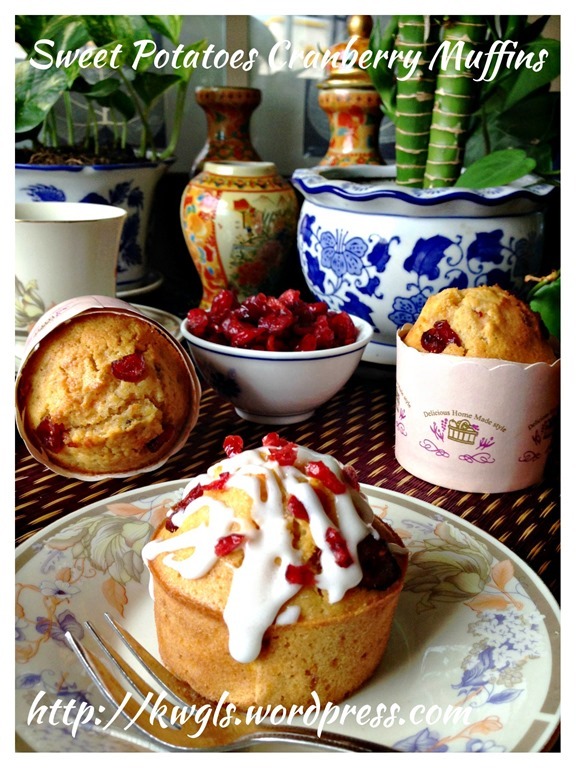 For this muffin, i have opted to use sweet potatoes puree. 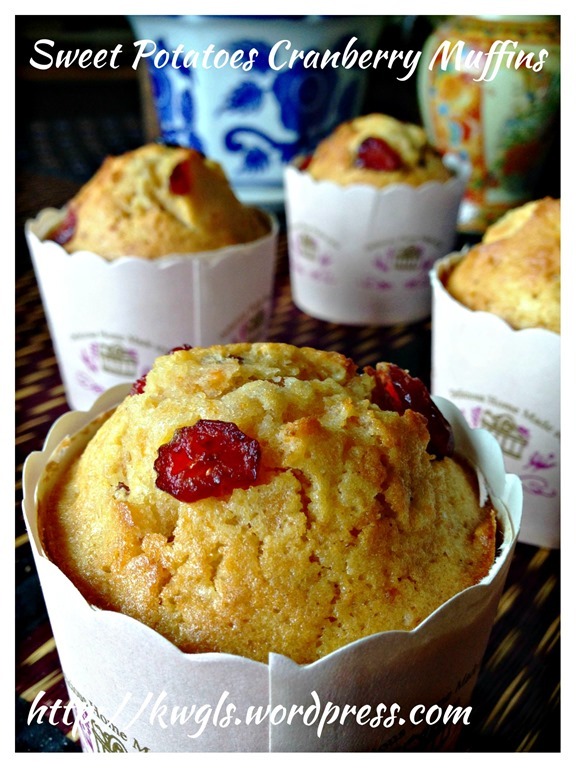 Sweet potatoes puree will help to retain moisture in the muffin and provide some sweetness to the muffins. Cranberry is optional. 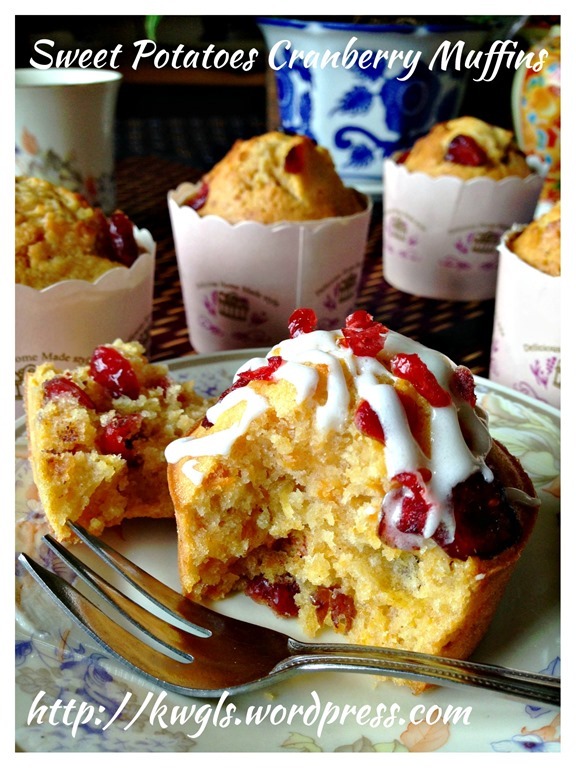 However, incorporating it in the muffin will provide some tanginess in the sweet muffin. 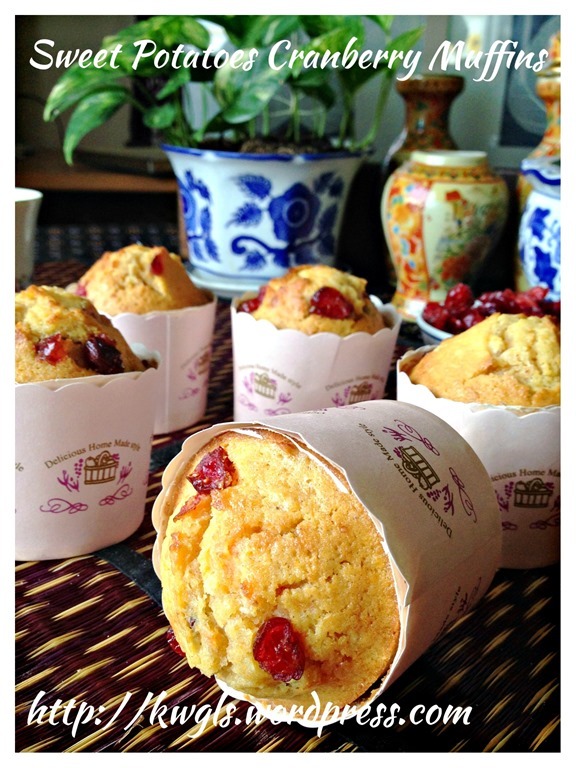 Pre-heat the oven to 180 degree Celsius and get ready 6-8 muffin cups. Put all the dry ingredients (mashed potatoes, cranberry, self raising flour, baking soda (sifted) and castor sugar), stir until it resemble some crumbles. In another bowl, mixed all the wet ingredients (cooking oil, milk and eggs) until well combined. Make a well in the dry ingredients and pour the liquid ingredients. Use a spoon to lightly mix it until well combined. Do not over mix the batter. Slightly lumpy is acceptable for muffins. 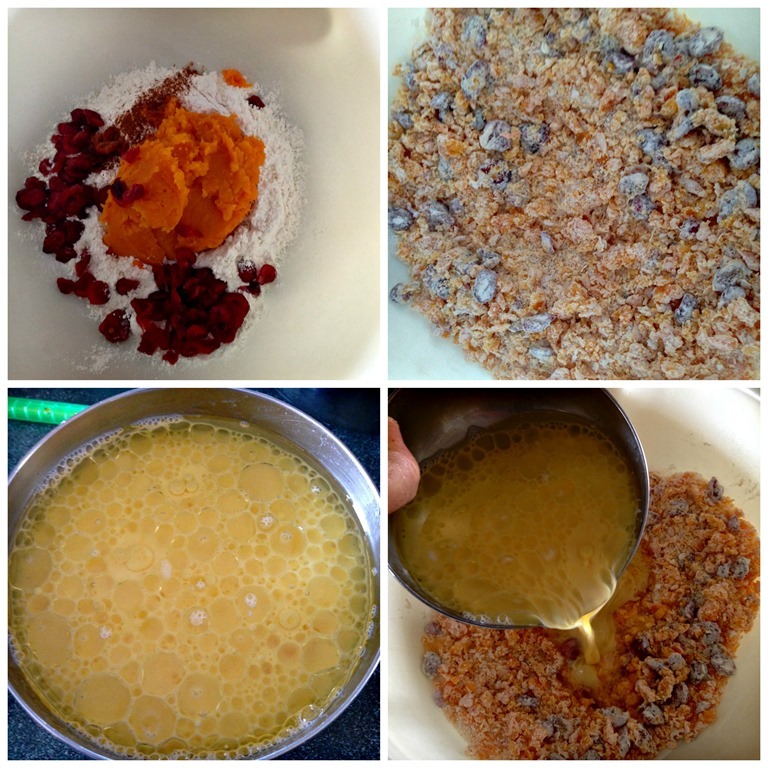 Over mixing will result in chewy texture of the muffins. 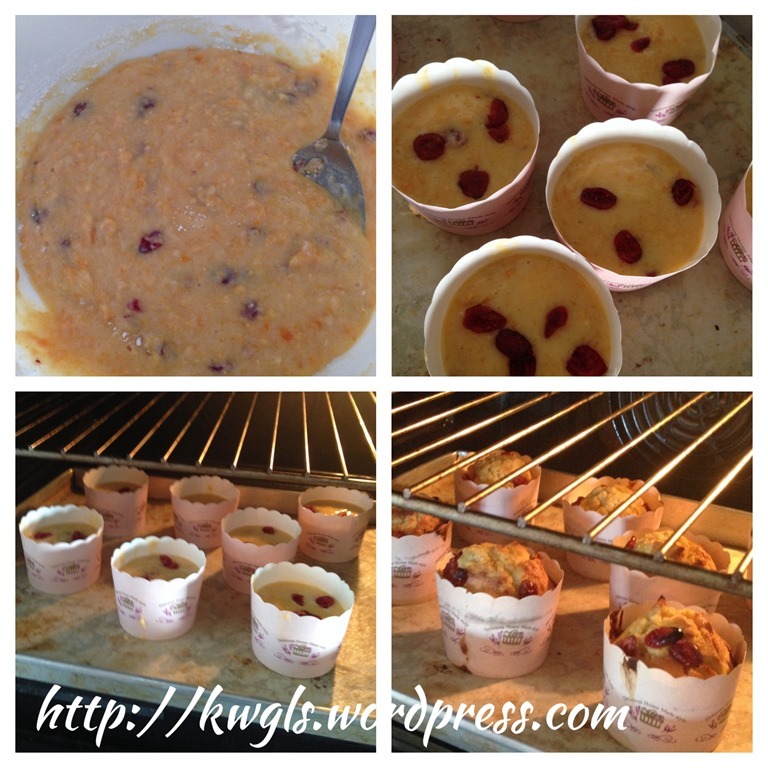 Transfer the batter to the muffin cups and baked in the pre-heated oven of 180 degree Celsius for 25-30 minutes or until a skewer inserted in the centre of the muffin comes out clean. 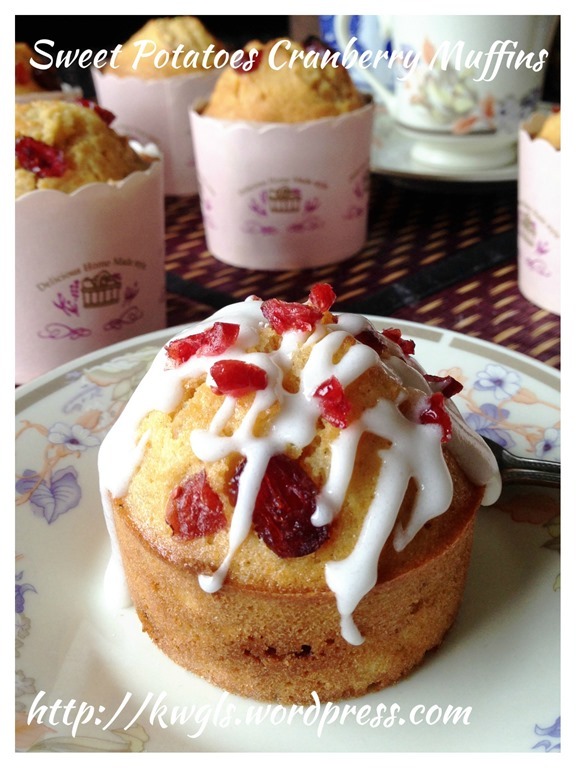 For simple icing glazing, mix 1 tablespoon of cold milk or cream to 1/4 cup of icing or powdered sugar. 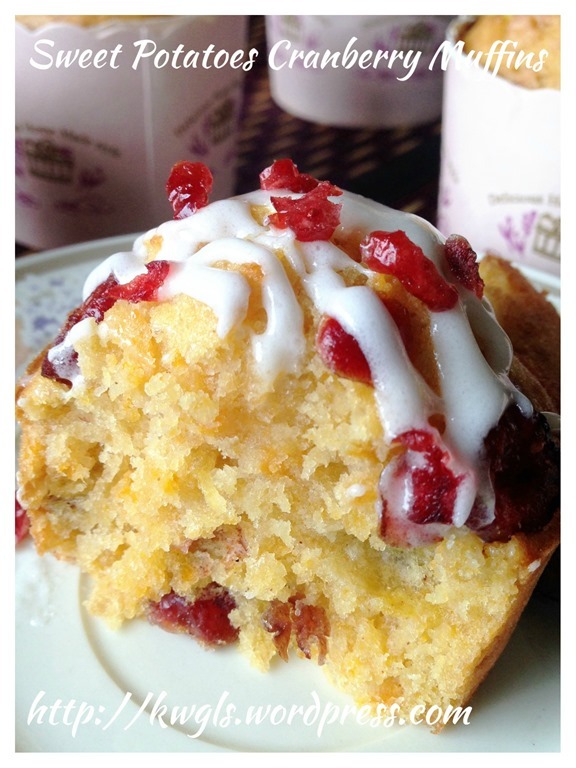 Stir until well combined and drizzle over the muffin. The muffins will become very moist after 3-4 hours of baking. It will start to absorb the moisture in the air back to the muffin as sweet potatoes is a good moisture retainer. It taste better especially after resting for one night. Though I have stated cinnamon as optional after considering Asian taste buds, but dashes of cinnamon powder will provide a well flavoured muffin. 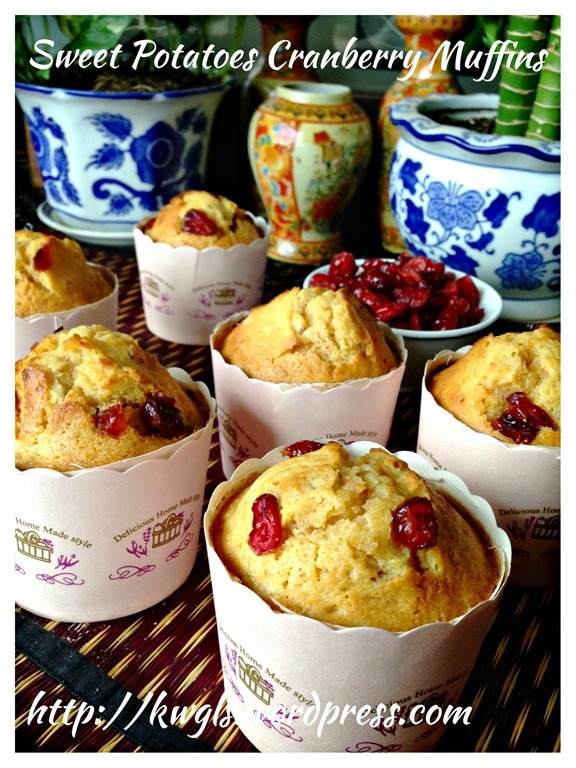 This entry was posted in Cakes and cookies, Food Preparation Series and tagged 8, 蔓梅地瓜小松饼, GUAI SHU SHU, Guaishushu, kenneth goh, postaday, sweet potatoes cranberry muffins, sweet potatoes muffins. Bookmark the permalink. Look yummy and I will try this week end. Hello Kenneth – is it possible that you have a weight conversion table or apps here on your website. That way, I just write it down immediately. Usually .. the qty and weight don’t get converted and end up .. not trying the recipes out. … Just wondering if it can be done. Also, the fonts that are in white here below near the comment section – can’t read it. Thanks Ken! !